"...connections, solutions & possibilities": Workshop: Healing Vibrations: Your Soul (Psyche) on Sound"
Workshop: Healing Vibrations: Your Soul (Psyche) on Sound"
• Experience different sound paths like, rattling (yes I said rattling), drumming, vocal toning, brainwave music and Singing Bowls. You will be amazed at their power to tone the mind, body and spirit. In this workshop we will learn about the healing paths of sounds, experiment with group soundings and experience a meditative "sound bath" from playing multiple singing bowls. 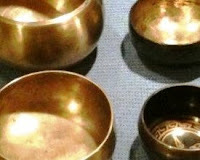 If you haven't experienced the healing sounds of the singing bowls you are in for a physical and mental treat. Backfull Info. or Why Sound? Join with us on the 17th to “taste” different auditory delights and custom designing your own healing sound toolbox. Music and instuments exists that increase brain waves which correlate with energy, focus, relaxation, creativity and even a good night's sleep.